Earn $61.37 in VIP credit. Click to Learn More. 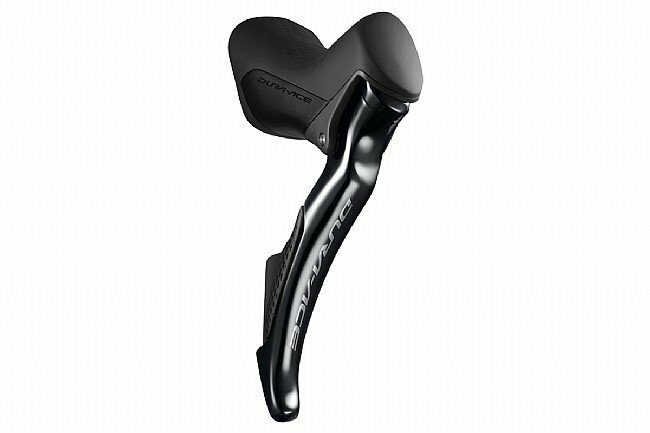 The Shimano Dura Ace Di2 ST-R9170 shifters have improved tactile feedback and a hydraulic braking mechanism that's balanced for racing. A refined rubber material on the hoods gives a more confident and comfortable grip, and hidden buttons at the end of the hoods can be programmed to work the shifters or various computer functions on compatible devices. Multi-shift can be enabled or disabled for each individual lever or button to avoid over-shifting in high-pressure situations, and compatibility with Synchro Shift means the front derailleur can be programmed to shift automatically with the rear for seamless, intuitive performance. Compatible with 11-speed Di2 electronic groupsets and hydraulic brakes.